It’s interesting that for a band as well regarded and well known within the early death metal scene as Death is, that there are very little straight up Death worship and imitator bands, especially considering the number of bands hitting that early thrashy death metal that Death and Possessed were spewing out in the late 80’s. However, Gruesome, a project fronted by Exhumed’s Matt Harvey, aims to monopolise on this hole with Savage Land, a set of 8 tracks (over 35 minutes) mimicking Death’s Scream Bloody Gore and, mostly, Leprosy albums. 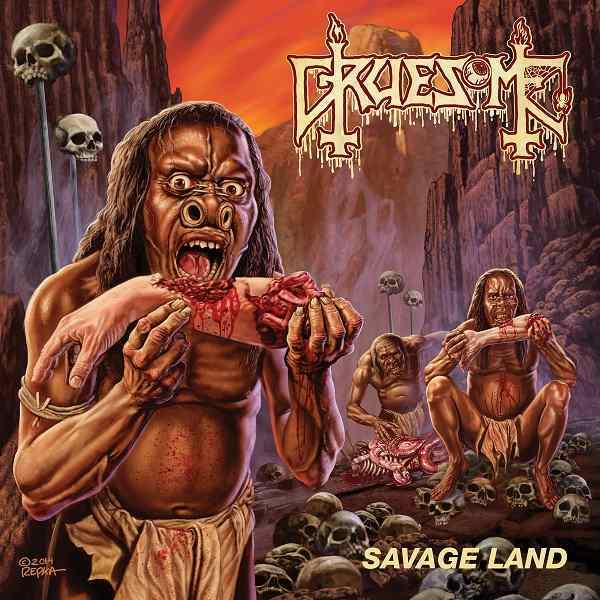 The Death influence rings strong not just within the music, but also within the general design of Savage Land; Gruesome’s logo is stylised in a manner similar to Death’s early style and Ed Repka, who did the cover art for Death’s first 3 albums, produces cover art eerily reminiscent of Leprosy’s art. So the question then is, does this make for a worthy tribute album to Death? The title track, Savage Land, with its Cannibal Holocaust inspired lyrics carves those worries away as it kicks the album off strongly; pounding drums and a cutting riff lead into Harvey’s chainsaw-esque lower end growls, tied in with along with a surprisingly catchy chorus. Much like Schuldiner, Harvey’s harsh vocals are well enunciated and relatively clear, so one can make out the viscera and gorey tales being told, and the memorable choruses are another item reminiscent of Death; with refrains of song titles punctuating the songs. The drums just underneath, hammering to provide simplistic but exhilarating patterns to get you headbanging. The bass drives along with the guitars, not quite being dominated by them but providing a deep sound to the overall album. The biggest problem with this album is that, much like Death on SBG and Leprosy, a lot of the songs tend to run together with similar riffing and drumming patterns and Harvey’s vocal delivery making each song quite similar to the previous, along with pace changes that are all too familiar. This is quite far from a mood killer, since there’s no truly bad songs on this album and the riffs are quite neck snapping but Savage Land does like a certain flair for song writing that made differentiating between Death’s relatively similar songs so easy and no tracks aside from the two ones released as demo tracks earlier (Savage Land and Closed Casket) stand out on their own. The production on this album is pretty great, its modern without being over processed and keeps all the instruments sound great with enough grit to keep a worthy Death sound. The mixing is also great, with the guitars and Harvey’s vocals out in front but not dominating, and the drums and bass set more towards the back to keep a deep support without falling too far into obscurity. In the end, Savage Land is a pretty strong tribute album to Death’s early works, and while Matt Harvey’s song writing chops aren’t quite up to prowess here, Savage Land is good at what it does. Recommended to people who love Scream Bloody Gore and particularly Leprosy.